Heaven and Earth is a contemporary and modern colorway assembled for The Legacy Quilt. 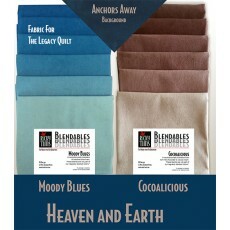 The Heaven and Earth colorway comes with four yards total fabric - twelve fat quarters and a yard of background fabric. This enough to make several blocks of your Legacy Quilt. When you are running low on fabric, come here to order more. Moody Blues has six fat quarters: A monochromatic transition of subdued blue hues. These colors are not available by the yard. Cocoalicious has six fat quarters: A special blend from Rich Milk Chocolate to Cocoa Cream. These colors are not available by the yard. Anchors Away - one yard piece to be used as the background fabric.